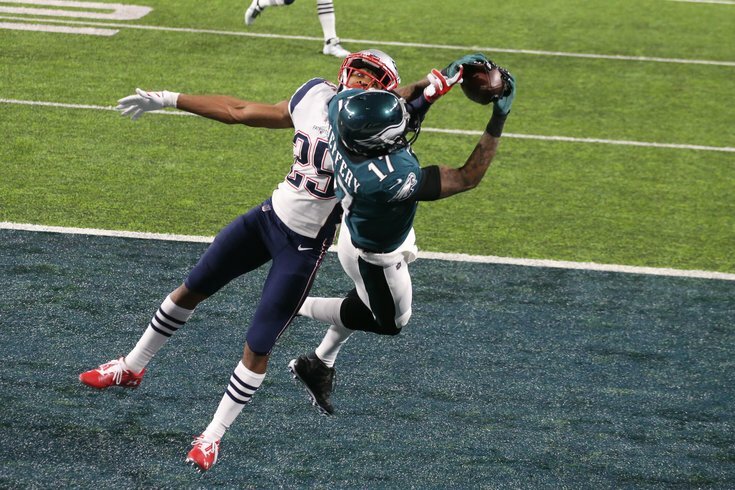 Alshon Jeffery did some stuff in the Super Bowl..
Philadelphia Eagles wide receiver Alshon Jeffery is going to miss at least the first two weeks of the regular season, according to Adam Schefter and Chris Mortensen of ESPN. In 2017, Jeffery had 57 catches for 789 yards and 9 TDs. In the postseason, he tacked on another 12 catches for 219 yards and 3 TDs. He was third on the team in receptions, second in yards, and first in TDs, an impressive feat considering he played the entirety of the season with a torn rotator cuff, which was operated on after the season. Recovery from that surgery is what is keeping him off the field. "He's working every day," said Doug Pederson on Tuesday. "He's progressed up to about 75 throws a day and really doing a nice job with that. We're just going to continue to monitor him and we'll see where he is at next week and make a decision." That decision had apparently already been made. Early in December of last year, Jeffery signed a four year, $52.25 million contract that will keep him under the team's control through the 2021 season. He was previously on a one-year deal he signed with the team during the 2017 offseason. In Jeffery's absence, the Eagles are likely to start Mike Wallace and Nelson Agholor, with Mack Hollins probably being the third receiver in. There's also a good bet that the Eagles will rely on more two-TE sets, featuring Zach Ertz and Dallas Goedert while Jeffery continues to recover.